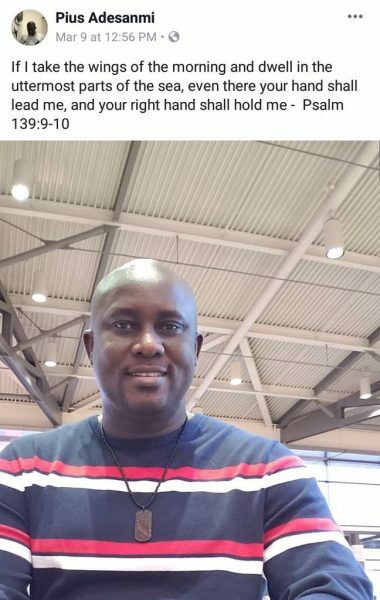 Pius Adesanmi — Nigerian-born Canadian professor, poet, literary critic and columnist — was among the 157 passengers aboard the Ethiopia Airlines Boeing 737 MAX 8 that crashed on March 10, 2019, just outside of the Ethiopian capital of Addis Ababa, with no survivors. Adesanmi was on his way to Nairobi as a guest speaker at the African Union Economic, Social and Cultural Council meeting in Nairobi, Kenya. Adesanmi, one of Nigeria’s – nay Africa’s – finest public intellectual started his academic journey at Nigeria University in Ilorin, Kwara State, where he earned a first-class degree in French in 1992. He moved to the University of Ibadan for a Masters degree in French (1998) and the University of British Colombia for a doctorate in French studies (2002).